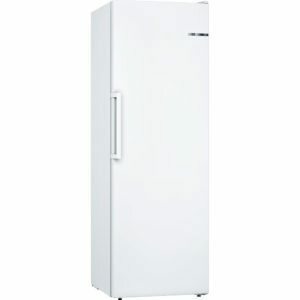 Freestanding freezers can be plugged into an indoor electrical supply anywhere in the house and they can begin freezing. As they don’t need to be installed in a unit freestanding models are more flexible in their placement and can easily be moved when cleaning or rearranging. With a range of designs in a variety of colours, there are many options available. 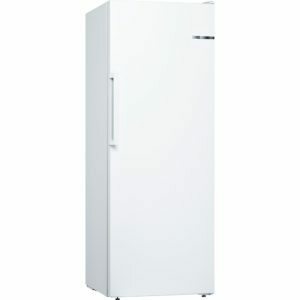 For instance, an undercounter model can be a great way to save space, a classic upright model is a market favourite and chest freezers can go anywhere in your home. Look out for a frost free model which is maintenance free and perhaps consider a matching freestanding fridge for real impact and versatile storage. With models from the likes of Liebherr, Hotpoint, Samsung, Siemens and more available, you’re sure to find what you’re looking for below. If you don’t, then head back to our expansive refrigeration section. 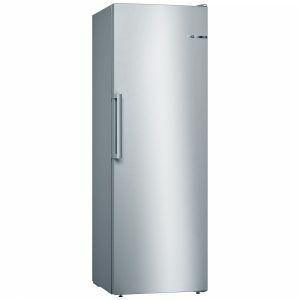 With a focus on spacious, adaptable yet high performance freezing, Bosch have outdone themselves with the GSN36VL3PG. Offering 242 litres of space with an A++ energy rating, you can flexibly adjust interior drawers and shelves thanks to the Vario Zone system. As this freezer includes Big Box drawers, there's space for large items or for easy stacking, and to make it even easier to reach items that need to be kept upright, Bosch have though up an Easy Access zone - smart! Regulated by Fresh Sense technology, an even temperature is kept throughout for the perfect storage of all your food, and this model ensures that the interior is frost free. No more time consuming manual defrosting! 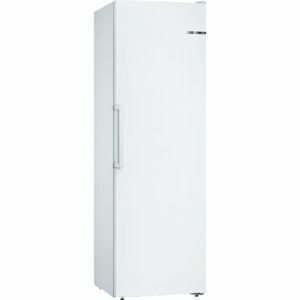 We love this fantastically flexible and roomy freezer, which is perfect for the busiest kitchen. With a reversible door and plenty of space in the 225 litre interior, you will be able to slip this in your kitchen and fill it with the biggest of weekly shops! 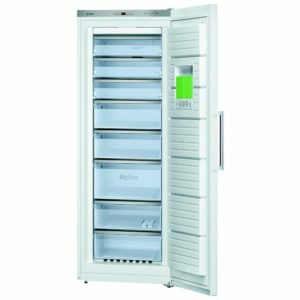 An A++ energy rating ensures that the running costs are kept nice and low, and you can even use the Super Freeze function, which is ideal when you need to load in the shopping while the temperature is kept perfectly chilled. As it is also frost free you can save yourself time and convenience as you will never have to manually defrost the inside again, what a handy feature! 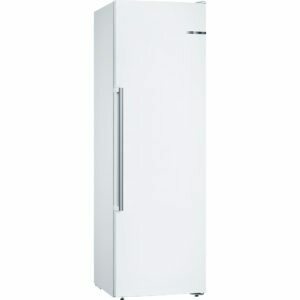 You will be able to fit in the weekly shop with ease in this roomy freezer from Bosch! With 200 litres of space, there's room for joints of meat, vegetables, ice cream...the list goes on. And as it is frost free, not only will you save time with no more manual defrosting, but every item will be perfectly preserved. The handy Super Freeze function is especially useful when it comes round to loading up the freezer, as it helps keep the interior nice and cool. 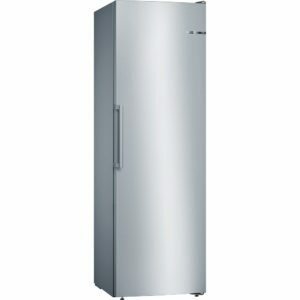 Offering an impressive 360 litres of space, this A++ energy rated freezer will easily fit in all your food while keeping running costs nice and low. Intelligent Fresh Sense cooling systems monitor and regulate the internal temperature to provide the perfect environment for keeping all your food in optimum condition. The GSN58AW30G is also frost free, spelling the end of time consuming manual defrosting and with the adaptable Vario Zone shelves and drawers, you can fit in even the bulkiest of items - Bosch have thought of everything! This superb frost free freezer from Bosch not only offers plenty of space with 242 litres of capacity, but saves you time as you can wave goodbye to manually defrosting! Vario Zone shelves are incredibly adaptable as you can adjust them as you need to and with the Big Box drawers there's space for large items or stacking boxes, particularly if you love pizza as much as us! The Ice Twister is perfect for those hot summer days, chill your drinks with up to 20 cubes at a time and as it is removable it's incredibly practical as well. With an A++ energy rating you can be assured that your energy costs are kept low at the same time. Built to Bosch's fantastic high standards, the GSN36VB3PG certainly offers amazing performance and versatility. With 242 litres of space there's plenty of room and featuring Vario Zone shelves and drawers that can be adjusted you will be easily able to fit in the weekly shop. All cooled using Fresh Sense technology, which actively monitors and regulates the temperature for perfectly preserved meats, juicy veg and creamy ice cream. To save you time, this model is frost free, spelling the end to manual defrosting and making life just that little bit simpler. With an impressive 242 litres of capacity and clever flexible storage options, you will be able to get the whole family shop in the GSN36VW3VG with ease! With fantastic time saving features like a frost free interior, you never have to manually defrost again! As this model uses clever Fresh Sense technology, it keeps an even temperature throughout, keeping everything from meat to ice cream in top condition. We love the Big Box as well, which is great for the large items, or just stacking boxes inside. 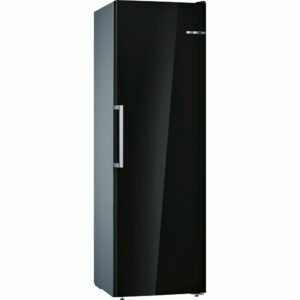 With Super Freeze able to keep the temperature low even while you load in the shopping and brilliant adaptable shelves and drawers, this freezer is ideal for even the busiest family kitchen.